While most people were enjoying time off at year’s end, I worked. And I didn’t mind. There was nary a creature stirring, which meant that I could clean out my inbox, sort through files and basically get set for the New Year. I find it helpful to do this exercise twice a year, usually in January and again in late August around back-to-school time. I do it both at home and at work. Have the necessary supplies on hand. It’s easier at work, where we have a supply closet. At home, it usually leads to a quick run to a store. Files and labels are critical. So are trash bags (more on that in # 3). Start with the desk surface. I take everything off my desk and clean the surface. Once I do that, I don’t usually want to put everything back. I tend to only keep out the files and papers that are critical for that time. The rest are filed in a drawer. My stapler, tape dispenser and other such supplies are corralled in a desk drawer. I have an attractive container for my pens and pencils. Open the drawers. Go through each drawer and see what you no longer need. Throw the non-essentials into the trash bag and recycle the paper. I limit myself on storage deliberately. 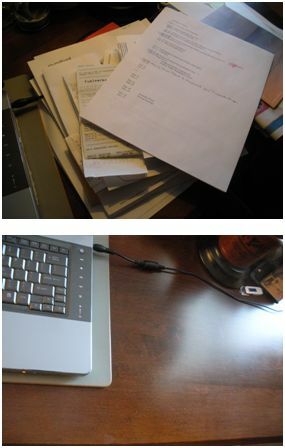 Most of my files are electronic, which helps cut down on clutter. If I discover business cards, I enter them into my contacts online. I also connect with the person via LinkedIn. Research material that is no longer needed is discarded. My files all have a specific name. I don’t allow for a “miscellaneous” folder as that’s too easy to fill with anything and everything. I do have a folder, though, in which I can stash notes or emails for a month or two. Then I have to toss them. Review your computer files. I know you thought you were finished, but you’re not. Electronic storage needs to be reviewed and cleaned up. If you have files that you don’t need, delete them and empty the trash. Do you have thousands of emails in your inbox? Do you really need them? Delete or archive as needed. Better yet, respond. And don’t store files on your desktop thinking it’s a short cut. Before long the desktop is cluttered. Now you are ready for the New Year!